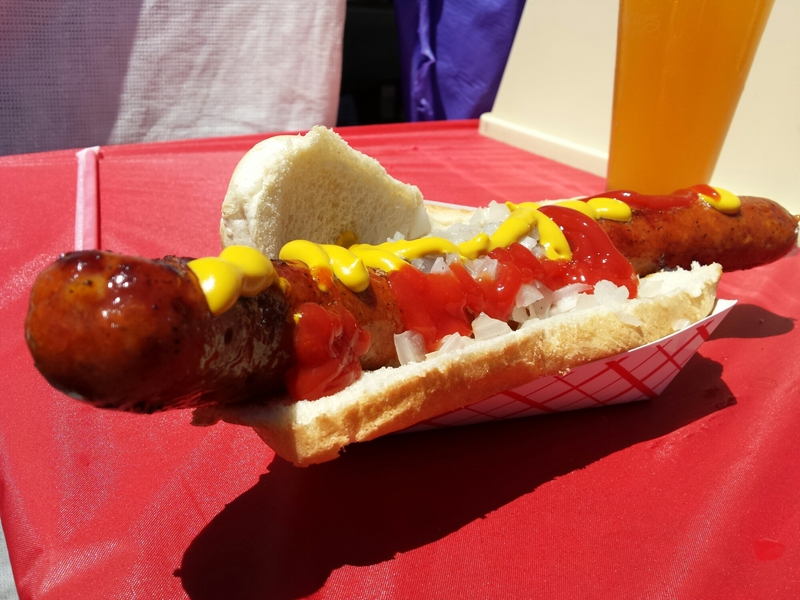 Have a Dinosaur Leg Taste at Menlo Park’s Connoisseurs’ Marketplace! July 20, 2015 July 20, 2015 ~ Trevis Dampier Sr. In the 1920s, Bernays was approached by the Beech-Nut Packing Company – producers of everything from pork products to the nostalgic Beech-Nut bubble gum. Beech-Nut wanted to increase consumer demand for bacon. Bernays turned to his agency’s internal doctor and asked him whether a heavier breakfast might be more beneficial for the American public. Knowing which way his bread was buttered, the doctor confirmed Bernays suspicion and wrote to five thousand of his doctors friends asking them to confirm it as well. This ‘study’ of doctors encouraging the American public to eat a heavier breakfast – namely ‘Bacon and Eggs’ – was published in major newspapers and magazines of the time to great success. Beech-Nut’s profits rose sharply thanks to Bernays and his team of medical professionals. According to some paintings, one of the earliest turkey-leg wielders was Henry VIII, the corpulent 16th-century British king, who is sometimes depicted holding or chomping on a turkey leg. Some observers believe this is an anachronism and that the bird, which was native to the New World (and some sources disagree about that), didn’t make it to England till after Henry’s death in 1547. Up to you but about $12 or less.. Better have cash..
Super huge sausage links, smoked turkey legs, or whatever fits your fancy..
It’s summer time and no better place to be in the sun than a festival with music and delicious food. 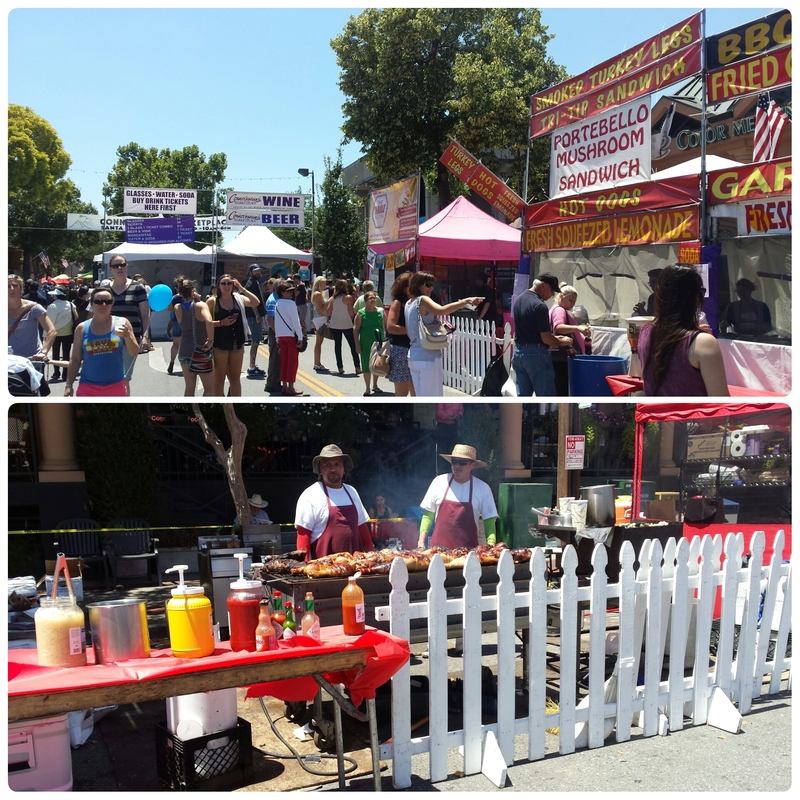 Here in the Bay Area there is usually a festival celebration of many kinds every weekend in the summer. Whatever the celebration, there is usually good music and great food. 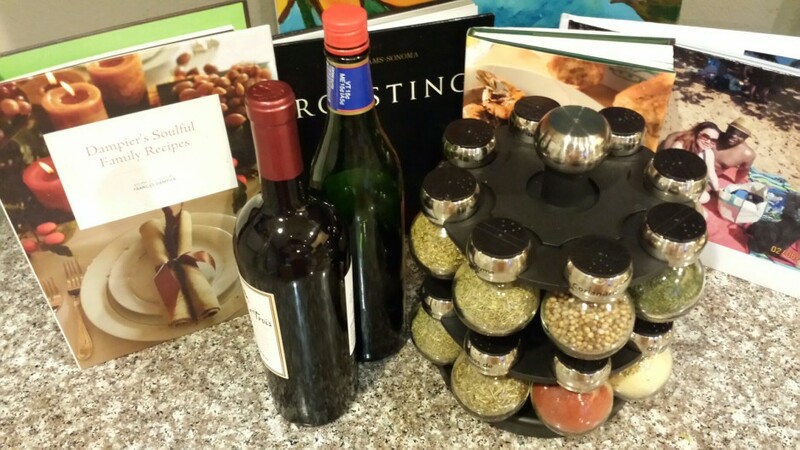 Today we celebrate at Menlo Park’s Connoisseurs’ Marketplace! So it’s Saturday and we’re looking for something to do. I google searched festivals in the Bay Area and found that Menlo Park is the place to be. I instantly started thinking about enormous dinosaur sized corn dogs, hot dogs and smoked turkey legs! For all the years of attendance I have ever had at county fairs or festivals, I have always made sure to indulge in the great tasting vittles. Since I can’t find these monstrous hot dogs or smoked turkey legs anywhere else, I’m definitely diving in! We arrive at the event and right away you see a vendor booth for Cajun sausage links hot off the grill. My stomach was already growling but I wanted to make sure I made the right choice first so my wife and I kept moving. 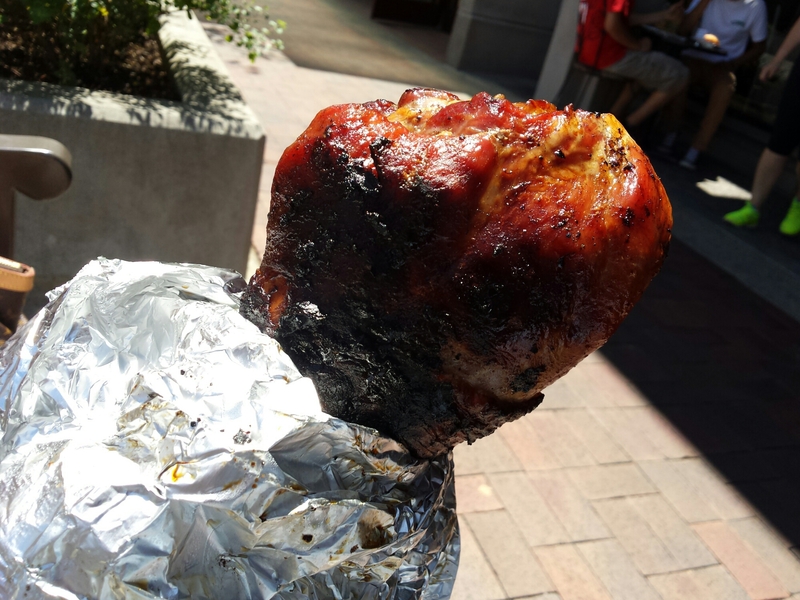 Next we saw another temptatious vendor booth with huge smoked turkey legs with it surroundings of nothing in the air but the barbecue smoke of delicious dinosaur treats ready to be engulfed down my throat. The mere sight of these ginormous hunks of meat made my mouth water! Time to get my beverage ready to wash down these delicious chunks of love, so we head over to the beer vendor shack and now we are ready to engage. I move to the super duper sausage vendor booth for a Cajun sausage link sandwich while my wife enters the realm of the renowned smoked turkey legs. People actually stopped us to take pictures of them because they were just mind boggling. Not only are they gigantic but tasty as well! Each bite into the sausage sandwich was a burst of tasty juices and it popped like a balloon in my mouth. It also had onions on it which really enhanced the sausage perfectly. I added some mustard and ketchup and now a complete masterpiece! The turkey leg is just ridiculous! The crisp layer on the outside that locks in all of this juicy piece of succulent meat is divine! Each bite is extremely savory, but the thing is so huge that no matter how many times you bite and attack it there is still more to go. Man this leg is good! True live action eating! Good job Menlo Park! Other than the great food, they had plenty of musicians for entertainment and plenty of vendors to offer their goods for shopping A great experience for the community! If you have never taken time to enjoy a festival then I suggest that you do so soon. I promise you that you will not regret it! < Previous Starting my day at Bill’s Cafe! Next > Chinese Fast Food at it’s Best at Panda Express!